Like the calm after a storm, the recent official launching of the SLPP Manchester Chapter on 13 June 2015 was quite a sobering and resounding success. Just as if many of the guests who attended were there either out of sheer curiosity or to reminisce about the inaugural milestone dance held last year on 31 May 2014, the delightful guests simply whiled the night away with pleasure and entertainment into the little hours. The masquerade was in over-drive and caused guests to join in the konga dance as well. Once again, you could just about hear reverberating murmurs all around the hall saying “Chairman Sonnah and his Team have done it again. They never disappoint“. There was a high powered delegation of SLPP UK & Ireland members including top Executive Committee members in conspicuous attendance, such as Mr Nathaniel Sandi, Ms Hawa Benjamin, Ms Mariama Gbao and Mr Ansu Momoh who led the vanguard of solidarity last year. So too was SLPP UK/I Chairman Mr Jimmy B Songa together with other esteemed SLPP UK Chapter Chairmen, including Messrs Ibrahim Janneh (Birmingham); Abu Sheriff (Bristol); and Ahmed Wurie (Reading) who jointly conferred the Chapter status on the SLPP Manchester membership. Chairman Songa in his remarks highlighted the fact that the occasion was a product of his long standing manifesto commitment to ensure that SLPP has presence throughout the UK. 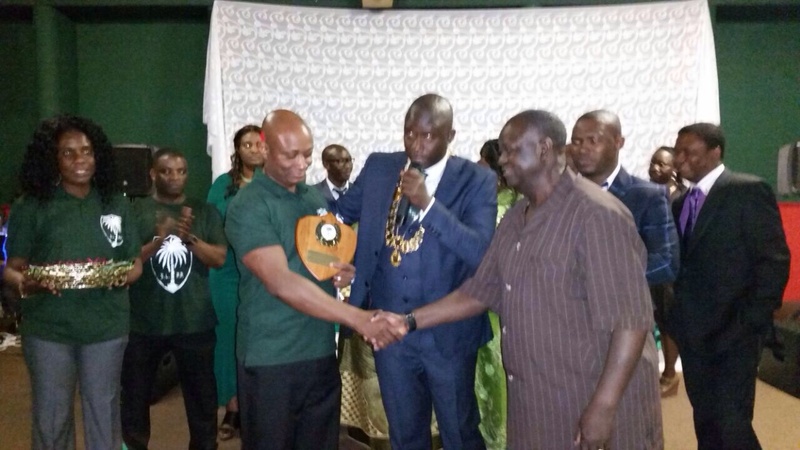 He commended SLPP Manchester Chapter for their dynamic steadfastness and asked everyone to continue supporting him and his desire to walk side by side with the next “successuful SLPP flag bearer presidential candidate to state house“. Of course, the SLPP Women’s Leader, Mrs Nancy Sandi, held the hall spell bound as she was remembered for her kind leadership in mobilising her colleagues, when Ms Zainab Sheriff was suddenly taken ill which resulted in her being hospitalised. Last year’s MC, Ms Nancy Banya and many other staunch members of the women’s wing including Mrs Makii Aziz-Kamara, Mrs Yatta Songa, Ms Kafue Banya, Ms Isata Yumkella, Mrs Musu Dumbuya and innumerable numbers were all there in dazzling style. The entire evening was officiated by the vibrant MC Mr Fredrick Moigboi. Setting the pace for the evening was the indefatigable SLPP UK & Ireland Branch Secretary, Mr Ansuman Bapoto Momoh, who looking dapper in his accustomed bespoke suit, addressed the party’s rank and file together with guests in the true spirit of a stalwart possessed of historical facts, knowledge of the party’s recent past and contemporary issues. With a clear sense of purpose and direction he lamented on the missed opportunities of what he saw as “where our founding fathers would have loved this party [SLPP] to be…As you leave this hall tonight” he starkly added “please tell the critics that the SLPP was founded on the principles of inclusion, tolerance and the Rule of Law. Just cast your minds back and you will realise that in order to form our great party, it took the courage and determination of three forward thinking parties with the sole aim of making Sierra Leone a better place. Tonight, I ask you to take a deep breath and introspection and show the same resilience and resolve to regain unity and peace in our dear party“. Overall, Mr Ansu Momoh led the SLPP UK & Ireland Branch high command with a stirring speech that was widely seen as a much needed rhetorical flourish and unifying address before proudly taking his seat knowing that his stewardship and long untainted service to the SLPP had once more been brought to the fore and put beyond doubt as the guests nodded approvingly and with approbation at what one youth aptly described as “a safe pair of hands and someone who knows exactly what the party needs right now. He only cares about reconciliation, peace and the development of the party“. 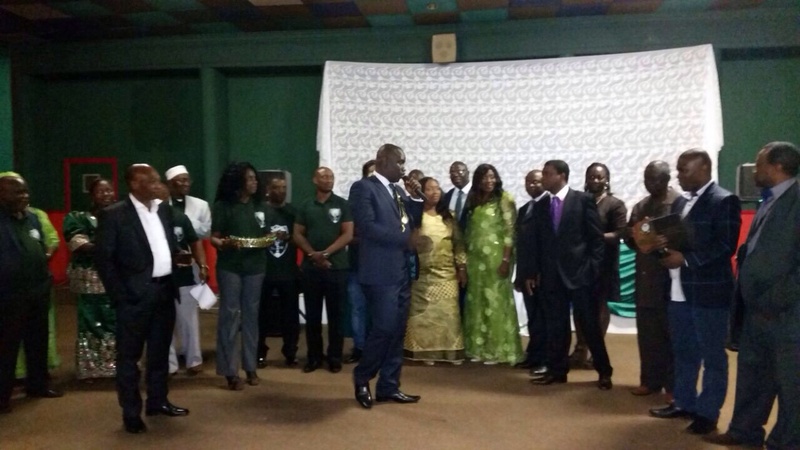 The SLPP Manchester Chairman, Mr Abraham Sonnah, held his own as chief host and resident Chair of proceedings. In a single defining moment, he narrated the “story of the Manchester group and their determination to see the success and progress of the party“. He reflected on the misfortunes of recent past, notably, the sudden ill health of one of its stalwarts who but for the grace of God is now recuperating before inviting the entire SLPP Manchester Executive Committee to come forward. This show of unflinching magnanimity marked the high point encapsulated in a narrative of issues and ideals that characterise the timeless emotional journey of how far they’ve come to make the evening a monumental feat. Throughout the evening, the SLPP Manchester Chapter was the proud beneficiary of random goodwill and pleasantries. Like a chaste and much sought after lady about town, suitors jostled to festoon her with petals of roses. The outspoken SLPP flag bearer aspirant, Mr Alie Kabba, fired the first salvo through his UK Team with a handsome donation of $320.00. Dr Kandeh Yumkella through his UK KKY Movement also pledged £300.00; while George Carew announced a pledge amounting to $1,000.00 on behalf of an internal peace building group of which he says Messrs Nathaniel Sandi and Ansu Momoh are figureheads. These were bold gestures at a time it mattered the most. Vote of thanks was delivered by the dynamic treasurer – Mrs Kathleen Kandeh acknowledging the role of women from different nationality, who have stood by their SLPP husbands. She also paid tribute to Mr Moses Kamara, an active member during formative stage of the organisation, who is currently unable to fully participate due to poor health. The evening went well with everyone realising that the party’s best interest should remain paramount. It was a truly wonderful event and it proved what the party stands to gain in times of unity, peaceful coexistence and a strong belief in the core values of SLPP. “One People One Country – One Country One People” they chanted loudly.